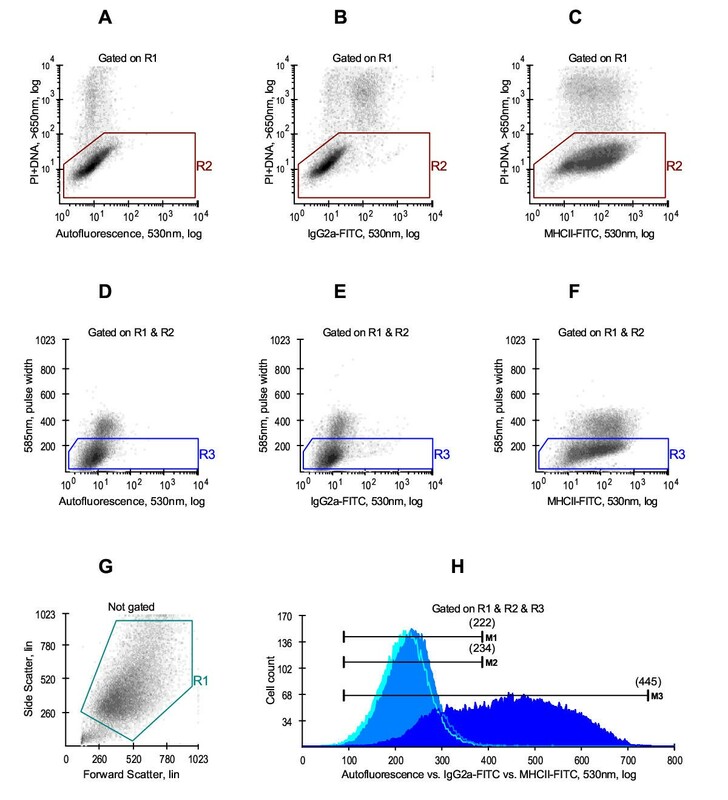 The expression of major histocompatibility complex class II (MHCII) antigens in both mouse and human tumors is rare, and these antigens are not easily inducible by IFN-gamma (IFNg). Since MHCII may play an important role in the development of host antitumor immune response, we explored the possibility of restoring MHCII inducibility in several IFNg-resistant tumor cell lines using protein kinase C (PKC) agonists phorbol myristate acetate (PMA) or Bryostatin. Tumor cells were co-cultured with various concentrations of PMA and IFNg for 48 hr. The expression of MHCII antigens and receptors IFNgR1 and IFNgR2 was determined by flow cytometry. 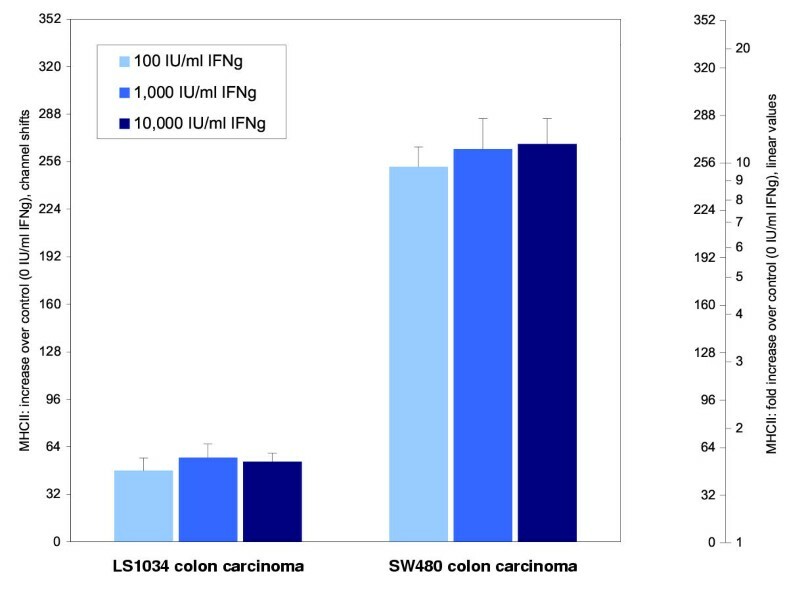 We showed that the presence of as little as 0.1 ng/ml of PMA in tissue culture restored the ability of weakly inducible LS1034 colon carcinoma cells to express MHCII in response to IFNg (100 – 10,000 IU/ml) in a dose-dependent manner. Likewise, Bryostatin 1, as low as 10 ng/ml produced a 5–6 fold upregulation of MHCII. The effect of PMA was not observed in two other poorly responding cell lines, MSTO-211H mesothelioma and HepG2 hepatocellular carcinoma, and was abrogated by relatively high concentrations of PKC inhibitors staurosporine (100 nM) and GF 109203X (1,000 nM). Both surface and intracellular staining of all cell lines with antibodies against IFNgR1 and IFNgR2 failed to detect any increase in IFNg receptor expression following incubation with PMA. 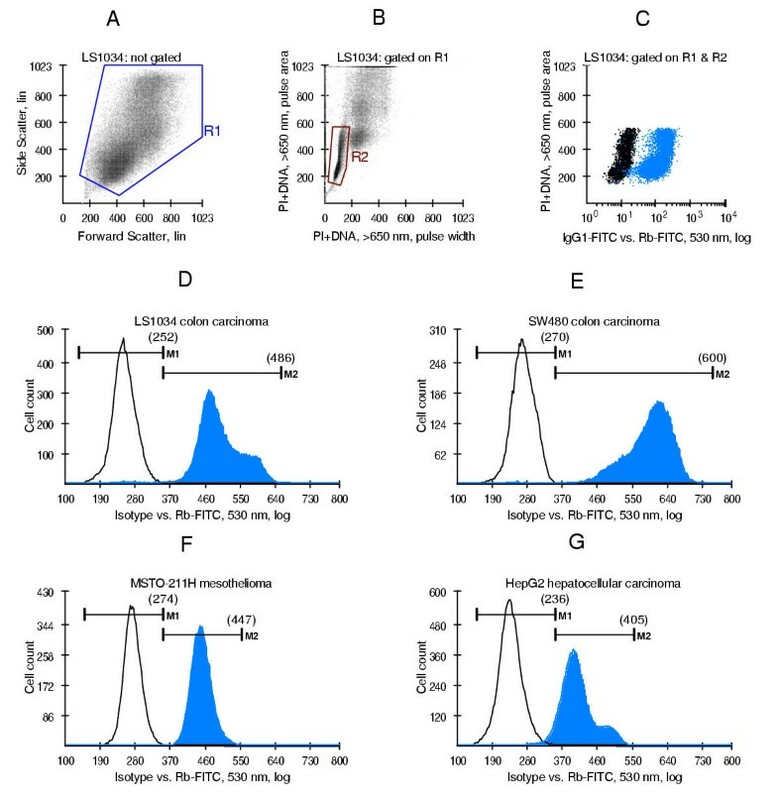 In this study we showed that IFNg-inducibility of MHCII antigens in weakly inducible LS1034 colorectal carcinoma cell line can be rescued by concomitant incubation with PKC agonists. Bryostatin 1 may be considered for further investigation of IFNg-dependent MHCII induction in resistant tumors in vivo. Major histocompatibility complex class II molecules (MHCII) are heterodimeric transmembrane glycoproteins that bind antigenic peptides and present such peptides to CD4+ T cells. Although MHCII are not expressed by the vast majority of studied mouse and human tumors, CD4+ T lymphocytes specific to MHCII-restricted tumor antigens have been found in various cancers . Those lymphocytes are believed to be generated in vivo following the recognition of MHCII-tumor peptide complexes expressed by host antigen presenting cells and can cause regression of MHCII-negative tumors indirectly, via secretion of cytokines such as IL-2 or IFNg . The released cytokines can recruit and activate cytotoxic CD8+ T lymphocytes and/or accessory cells (eosinophills, macrophages) which further mediate tumor destruction. It has been recently appreciated that sufficient concentrations of secreted IFNg may also induce susceptible tumors to express the MHCII molecules, potentially leading to increased direct contact with CD4+ T cells . Even though some reports indicate that tumor sensitivity to IFNg is not required to elicit tumor regression , it is conceivable that the IFNg-induced MHCII expression on tumor cells may boost the effector phase of antitumor responses through additional cytokine release or direct tumor eradication by CD4+ T cells. Indeed, the CD4+ T cells that directly destroy MHCII-positive tumors were identified . In the clinic, the expression of MHCII on colorectal carcinomas is correlated with more favourable prognosis . Adoptive transfer studies show that ex vivo activated CD4+ T cells are able to recognize, and to eliminate, MHCII-positive tumors either by themselves  or in co-operation with CD8+ T cells . It has been also demonstrated that the increased MHCII expression on tumor cells and macrophages following treatment with IFNg in vivo was associated with enhanced efficacy of adoptive T cell therapy in a mouse model of metastatic sarcoma . Unfortunately, the induction of MHCII on tumor cells by IFNg in vivo is difficult . In fact, the reported inducible tumors seem to be limited to freshly transplanted tumor cells [9, 11] or malignant cells present in the ascitic fluid . Many tumors do not express MHCII after treatment with recombinant IFNg in vitro either . Given the role that MHCII may play in tumor immunity, further attempts to restore inducibility in IFNg-resistant tumors appear to be warranted. In this regard, several substances have recently been tested using in vitro models of noninducible tumor cell lines. It was reported that some agents, e.g. histone deacetylase inhibitors  or DNA methylation inhibitors , can rescue the IFNg inducibility of MHCII in cultured tumor cells. In this study, we explored whether the effect can be achieved by yet another category of modulators, the PKC agonists, chosen because PKC has been shown to function as an upstream regulator of the MAPK pathway  that is involved in both IFNg signal transduction  and regulation of gene expression . Specifically, the influence of a potent PKC activator, PMA, and clinically tested drug, Bryostatin 1, on the IFNg-induced MHCII expression in several IFNg-resistant tumor cell lines was examined. Previously, PMA was shown to augment IFNg-mediated MHCII expression in MHCII-inducible tumor cell lines [19, 20]. Here, we report that the presence of PMA in tissue culture restores IFNg-dependent MHCII expression in the poorly-responding LS1034 colon carcinoma cell line but fails to produce this effect in two other IFNg-resistant cell lines, MSTO-211H mesothelioma and HepG2 hepatocellular carcinoma. We also show that the IFNg-dependent MHCII expression in LS1034 cell line can be rescued by clinically acceptable concentrations of Bryostatin 1. We first compared the induction of MHCII molecules in SW480, LS1034, MSTO-211H and HepG2 tumor cells in response to different concentrations of IFNg. MHCII antigens were initially undetectable in all cell lines tested. Incubation with as little as 102 IU/ml IFNg induced a 10-fold increase of MHCII-specific fluorescence in SW480 colon carcinoma cell line. In contrast, LS1034 demonstrated only weak (1.4- to 1.6-fold) increases in level of MHCII, and remained weakly inducible even when concentration of IFNg was increased to 104 IU/ml (Figure 1). 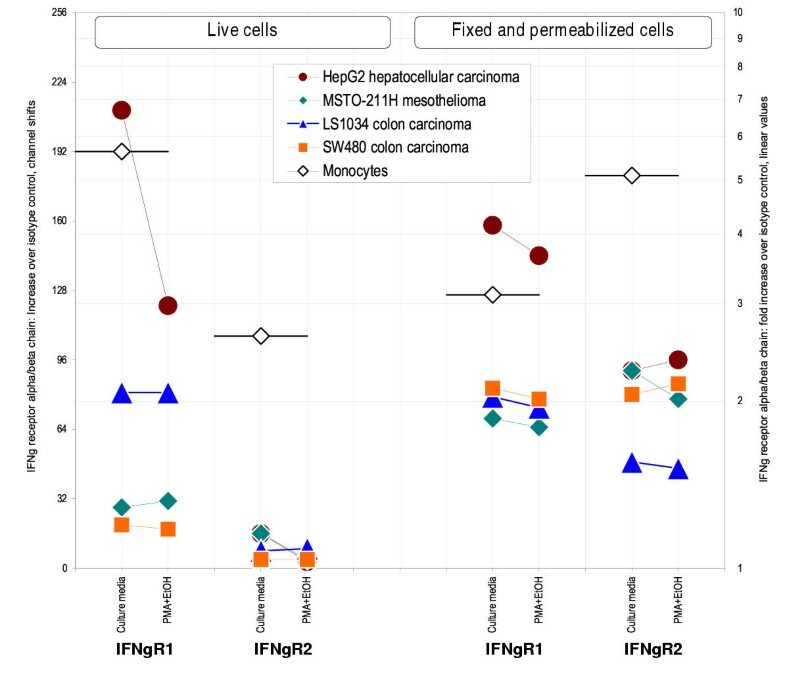 MSTO-211H, mesothelioma, cell line also showed a weak induction of MHCII in response to IFNg and HepG2, hepatocellular carcinoma, was completely non-inducible (data not shown). MHCII expression induced by IFNg in two colon carcinoma cell lines. Cells were incubated with various concentrations of IFNg for 48 hr. The difference in MHCII inducibility between the low responding LS1034 cell line (mean ± sd, n = 8 independent experiments) and the high responding SW480 cell line (mean ± sd, n = 2) is at least 5-fold. It should be noted, however, that we observed a small population of LS1034 cells (about 5–10% of all cells) that demonstrated a modest (3- to 4-fold) increase in MHCII-specific fluorescence after incubation with 102–104 IU/ml IFNg (data not shown). This could suggest that a small subset of LS1034 cells might acquire an inducible phenotype at a certain stage of cell differentiation. We next attempted to restore IFNg inducibility of MHCII in poorly responding tumor cell lines by adding PKC agonist PMA into culture medium containing variable concentrations of IFNg. PMA did not improve IFNg inducibility of MHCII in MSTO-211H and HepG2 cell lines (data not shown). The LS1034 cells, on the other hand, demonstrated a robust increase in MHCII expression. The magnitude of response of LS1034 cells varied greatly from experiment to experiment depending not only on concentration of IFNg, but also on concentration of PMA and even on type of the PMA agent (DMSO or ethanol). Therefore, the experiments were arranged in a factorial design for accurate analysis of possible interactive effects. For each combination of treatments, a 3-letter alphanumeric code was assigned (Table 1). Four dose levels of IFNg combined with 5 dose levels of PMA and 2 dose levels of ethanol generated 40 groups and the design was replicated 4 times. One-way ANOVA was performed on groups that are shown in italic font (08→12, 14→18, and 20→24). Two-factor ANOVA was performed on groups that are shown in bold font (09→12, 15→18 and 21→24). The results demonstrated a substantial increase in MHCII expression in LS1034 cell line following combined incubation with PMA and IFNg (Figure 2). Two-factor analysis of variance revealed that the magnitude of MHCII induction in LS1034 cells was almost totally determined by concentration of IFNg (F2;36 = 29.3, P < 10-6). Higher response to IFNg tended to be associated with higher concentration of PMA in some experiments, but the overall effect of PMA did not reach a commonly accepted level of significance (F3;36 = 1.9, P = 0.14). Interestingly, the effect of PMA did reach significance in cultures supplemented with 172 mM ethanol (F3;36 = 3.0, P = 0.043; groups 09b→12b, 15b→18b, 21b→24b). No interaction effect between PMA and IFNg was found (F6;36 = 0.14, P = 0.99). PMA rescues MHCII inducibility in low responding LS1034 colon carcinoma cell line. Expression levels of MHCII (mean ± sd) induced by combined treatment with IFNg and PMA are plotted on the left (A) and expression levels of MHCII induced by combined treatment with IFNg, PMA and ethanol are plotted on the right (B). The experiment was repeated 4 times. Different treatments were compared to group 20a or 20b (see Table 1 for details on group codes). Asterisks indicate significant differences on post-hoc tests: *P < 0.05 by Tukey's HSD test; **P < 0.05 by Scheffe's test (see the supplementary file "ANOVA.xls" for original data used to perform this analysis). Since there were no 2-factor interactions, several single-factor groups were added, and data were re-analysed by using one-way ANOVA. Different combinations of PMA and IFNg were compared to the highest dose of IFNg used without PMA (group 20a or 20b). Multiple comparisons were made using Tukey's HSD test and Scheffe's test (the latter test is more conservative). Results demonstrate that the expression level of MHCII reached a plateau at 103 IU/ml IFNg in the presence of 102–104 ng/ml PMA and 172 mM ethanol. Further increases in concentration of IFNg (to 104 IU/ml) did not result in statistically significant increases of MHCII expression (Figure 2B). Figure 2 also demonstrates that ethanol was totally inactive alone (compare group 20a vs. 20b) but it significantly improved the MHCII induction in the presence of PMA. Because of variation between experiments, the effect of EtOH could not be seen clearly in Figure 2. For that reason, pair-wise comparisons were made between cell cultures incubated either with PMA or with a combination of PMA and EtOH. Specifically, group 09a was compared to group 09b, etc. Data shown in Figure 3 confirm that EtOH significantly improved PMA-potentiated response to IFNg. Linear regression analysis also revealed that the effect of ethanol was more pronounced at 102 IU/ml IFNg. Ethanol potentiates PMA-rescued induction of MHCII in LS1034 colon carcinoma cells. The slope of the regression line at 102 IU/ml IFNg is significantly greater than the corresponding values at 103–104 IU/ml IFNg (1.63 vs. 0.63–0.61, P < 0.05). Taken together, the above results showed a strong potentiating effect of PMA on IFNg-induced HLA-DR expression in LS1034 cell line and no changes in two other poorly inducible cell lines. It has been previously shown that potentiating effect of phorbol esters on IFNg-dependent MHCII induction in THP-1 monocytic cell line was associated with the increase in synthesis of IFNg receptors . For that reason, we questioned whether PMA could produce similar changes in LS1034 colon carcinoma cells. We compared the expression of alpha and beta chains of IFNg receptor (IFNgR1 and IFNgR2) in LS1034 carcinoma and three other tumor cell lines before and after 48 hr incubation with 103 ng/ml PMA and 172 mM ethanol. Results, plotted in Figure 4, show that untreated and PMA-treated tumor cells express about the same levels of IFNgR1 and IFNgR2. Moreover, the level of IFNgR1 in HepG2 cells actually drops after exposure to PMA. Therefore, we conclude that it is unlikely that PMA action in LS1034 carcinoma is mediated through increased synthesis of IFNg receptors. Expression levels of IFNgR1 and IFNgR2 subunits of the IFNg receptor complex do not increase in four different tumor cell lines after PMA treatment. Cells were incubated in culture medium contaning 103 ng/ml PMA and 172 mM ethanol for 48 hr. Live (propidium iodide negative) cells were used to measure cell surface expression of IFNg receptors. Fixed and permeabilized cells were used to measure total expression of IFNg receptors (both cytoplasmic and cell surface). Mean values of two independent experiments are plotted. A substantial percentage of human tumors lose the expression of the retinoblastoma tumor suppressor protein (Rb), important as a necessary condition for IFNg-mediated induction of MHCII . Therefore, we wished to determine whether the poor IFNg inducibility of MHCII in LS1034, MSTO-211H and HepG2 cell lines could be explained by the loss of Rb. Immunofluorescent staining with a Rb-specific mAb (clone G3-245) demonstrated that all cell lines tested expressed Rb (Figure 5). Expression of the Rb protein in four tumor cell lines. Rb expression is not lost in weakly inducible LS1034 colon carcinoma (D) and MSTO-211H mesothelioma (F). Rb expression is also preserved in the non-inducible HepG2 hepatocellular carcinoma (G). Panels A-C show the experimental setup for measuring Rb-specific cellular fluorescence by flow cytometry. A closer look at Figure 5 reveals that the 4 cell lines can be ranked according to their Rb contents in the following order: SW480 > LS1034 > MSTO-211H > HepG2. This ranking would be valid only if fluorescence intensity correlates closely with the absolute contents of Rb protein per cell. However, this may not always be the case. For example, the number of epitopes recognized by G3-245 mAb may be reduced if tumor cells express viral oncoproteins that bind and inactivate Rb . It is important to note that certain mutations greatly reduce transport of newly synthesized Rb molecules into the nucleus where Rb performs its function . As the flow cytometry protocol does not allow us to discriminate between cytoplasmic and nuclear staining, the question about the presence of functional Rb protein in the examined cell lines remains open. The discovery of novel "non-kinase" phorbol ester receptors challenges the use of phorbol esters as selective PKC activators . Therefore, we were interested in whether a member of the PKC family mediated the effect of PMA in LS1034 cells or whether some other proteins could also be involved. Specifically, we investigated whether two inhibitors, staurosporine and GF 109203X, could abrogate PMA-potentiated response of LS1034 cells to IFNg. Staurosporine is a wide-spectrum kinase inhibitor and its specificity for PKC isoforms is limited to the 0.1–1 nanomolar range. In the 10–100 nM range, staurosporine inhibits more than 20 different kinases . 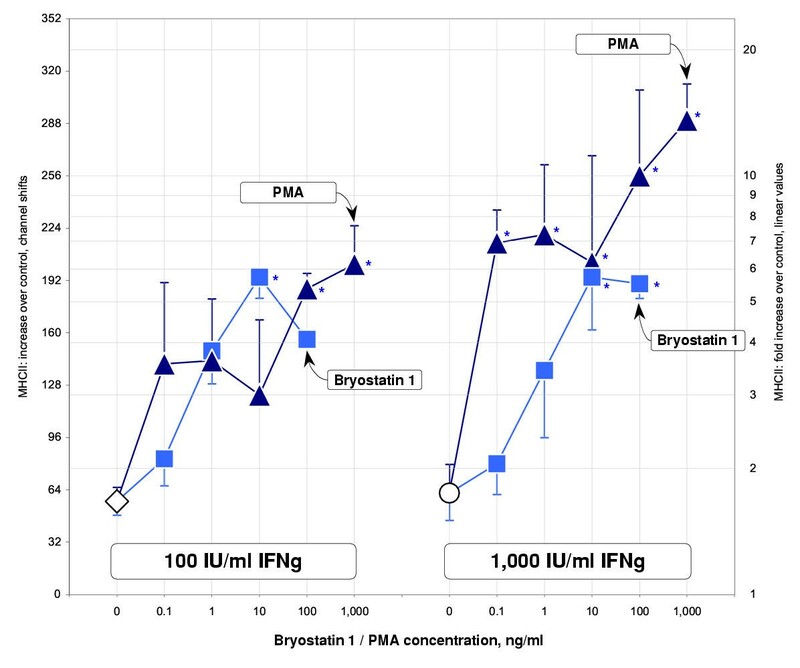 Data shown in Figure 6 demonstrate that staurosporine caused about a 50% inhibition of PMA-potentiated response in LS1034 cells at a concentration of 10 nM. Complete inhibition occurred at 100 nM. A much higher concentration of GF 109203X was required to completely suppress PMA-potentiated response in LS1034 cells. Physiological IFNg response in SW480 colon carcinoma cells was resistant to inhibition with 1 μM GF 109203X and was suppressed only when staurosporine concentration was increased to 1 μM. We conclude that the PMA effect in LS1034 cell line is most likely mediated by a PKC isoenzyme but other protein kinases that are sensitive to inhibition with 1 μM GF 109203X. Effect of protein kinase inhibitors on physiological and PMA potentiated responses to IFNg. Expression levels of MHCII induced by 1,000 IU/ml IFNg alone are indicated by triangles (▲). Expression levels of MHCII induced by combined treatment with 1,000 IU/ml IFNg, 1,000 ng/ml PMA and 172 mM ethanol are indicated by squares (■). IFNg and PMA were added after cells had been pretreated with Staurosporine and GF 109203X for 1 hr. Incubation continued for the next 24 hr in the constant presence of inhibitors. Physiological response to IFNg in SW480 colon carcinoma cells was abrogated by 1 μM Staurosporine. 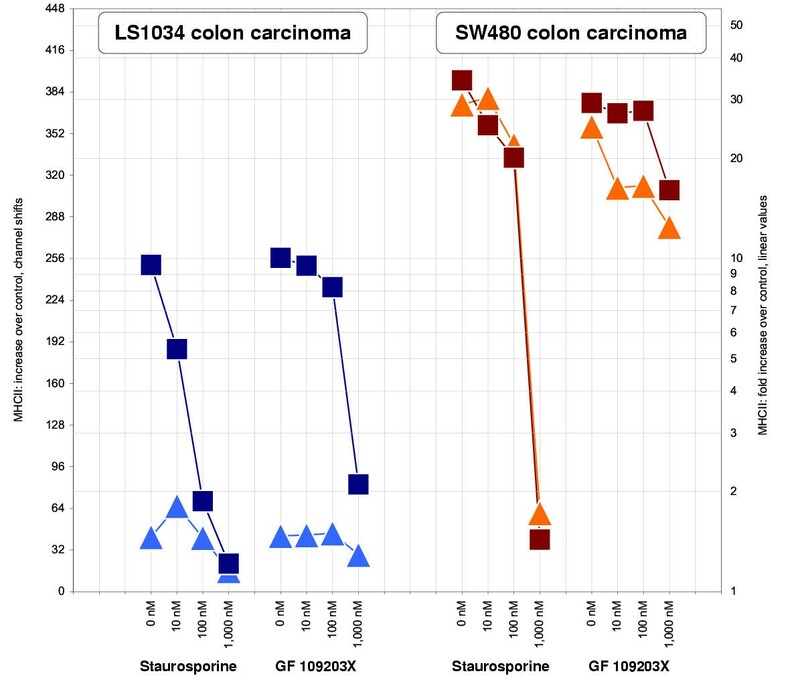 PMA-potentiated response to IFNg in LS1034 colon carcinoma cells was abrogated by 100 nM Staurosporine or by 1 μM GF 109203X. Mean values of two independent experiments are plotted. To evaluate potential clinical implications of our findings, we asked whether the IFNg-dependent MHCII expression in LS1034 cells could be restored by clinically achievable concentrations of PKC agonists. Bryostatin 1 is a potent PKC activator that has undergone extensive clinical testing for the treatment of hematological malignancies and solid tumors . Animal studies show that the concentration of Bryostatin 1 in various tissues after a single intraveneous injection stays in a range of 10–50 ng/g for a period of more than 72 hr . 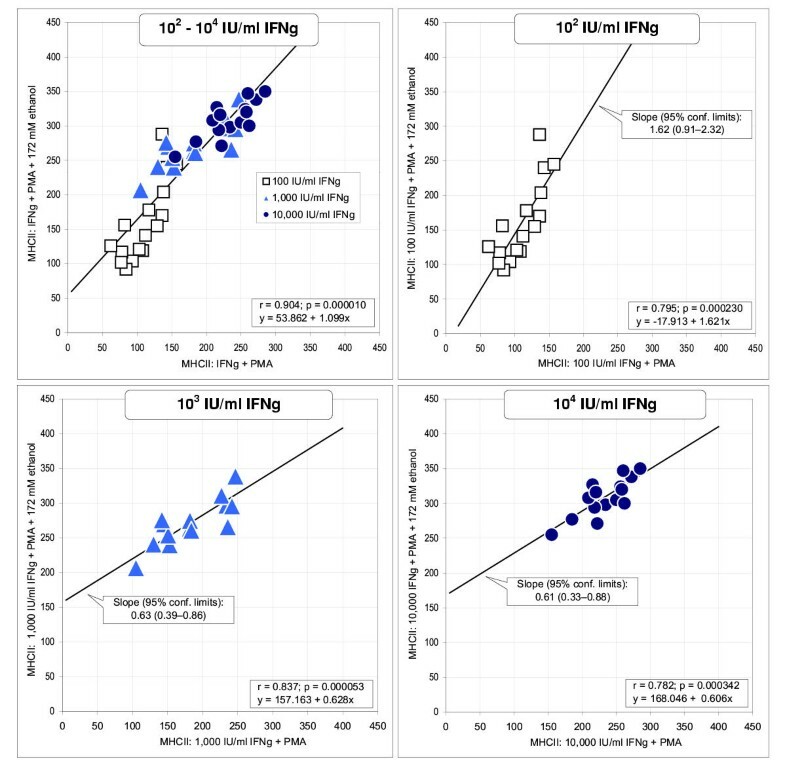 Data, plotted in Figure 7, demonstrate that 10 ng/ml Bryostatin added into the culture medium containing 102–103 IU/ml IFNg induced a 5- to 6-fold increase in levels of MHCII expression. The potentiating effect of Bryostatin first becomes noticeable at 1 ng/ml and then reaches a plateau at 10–100 ng/ml. At low concentration of IFNg (102 IU/ml), the effect of Bryostatin was comparable to that of PMA. At a higher concentration of IFNg (103 IU/ml), however, PMA was much more effective. This may suggest that either the two PKC activators act through different isoforms of PKC or PMA also activates enzymes outside the PKC family such as MAPK . Whatever the mechanism, it appears possible to restore the IFNg-dependent MHCII expression in LS1034 cell line by clinically acceptable concentrations of Bryostatin 1. MHCII inducibility can be restored in LS1034 colon carcinoma cells by a clinically tested PKC activator Bryostatin 1. Cells were incubated in culture medium contaning various concentrations of IFNg, PMA or Bryostatin for 48 hr. Different combinations of IFNg and PMA or IFNg and Bryostatin were compared to treatment with IFNg alone (the group indicated by the circle). Experiment was replicated 3 times. Mean values ± sd are plotted. Asterisks indicate the significant differences on post-hoc tests (* P < 0.05 by Tukey's HSD test). The potentiating effect of Bryostatin reached a plateau at a concentration of 10 ng/ml. The effect of PKC activators PMA and Bryostatin 1 on IFNg inducibility of MHCII in three resistant tumor cell lines of different histological origin has been examined. We found that PKC activators rescued high levels of MHCII expression in colon carcinoma cells and failed to do so in mesothelioma and hepatocellular carcinoma cells. A poor response of tumor cells to IFNg is in agreement with previous observations that many tumors acquire such resistance upon malignant transformation, possibly important as a mechanism of tumor escape from immune surveillance . The nature of this phenomenon is complex, and multiple defects that can prevent IFNg responses in tumor lines have been described. PMA could act through the JAK-STAT signalling pathway. It has been established that, to achieve its maximal transcriptional activity, STAT1 must be phosphorylated on both Tyr701 and Ser727 . Phosphorylation of STAT1 on Ser727 occurs in response to LPS, UV irradiation and other agents that activate the p38MAPK pathway . As phorbol esters can also stimulate the MAPK cascade through activation of PKC , it is tempting to speculate that combined treatment of cells with PMA and IFNg could increase the pool of STAT1 molecules phosphorylated on both Tyr701 and Ser727. This effect is most likely mediated by PKC-delta isoenzyme as this particular PKC isoform appears to be critical for phosphorylation of STAT1 on Ser727 and activation of p38MAPK . Alternatively, PMA treatment could initiate a cascade of protein phosphorylation leading to the increase in transcriptional activity of chromatin at the type IV promoter of CIITA and/or promoter of MHCII genes. Expression of many genes can be modified by treatment with agents acting at the level of enzymes and nuclear receptors that modify transcriptional activity of chromatin. Thus, histone deacetylase inhibitors – Butyrate and Trichostatin A – can rescue MHCII-inducibility in bladder carcinoma cells  and restore constitutive MHCII expression in plasmacytoma cells . In addition to acetylation, transcriptional activity of chromatin is also regulated through phosphorylation (reviewed in Ref. ). It has been shown that treatment of cells with phorbol esters leads to accumulation of phosphorylated H3 histones . Therefore, it seems possible that in LS1034 cells PMA could enhance transcriptional activity of chromatin at promoters of MHCII and/or CIITA genes. This possibility appears particularly important since the specific lack of CIITA inducibility was cited as the most common basis for lack of IFNg-induced MHCII expression among Rb-positive human tumor lines [13, 21]. Another reported mechanism of IFNg resistance in tumor cells is associated with down-regulation of IFNg-receptors . The relevance of this mechanism to MHCII inducibility was recently supported by the evidence that PMA is able to enhance IFNg-dependent MHCII expression in THP-1 human leukemia cells through the up-regulation of IFNg receptors . In our experiments, however, the incubation of LS1034 cells with PMA and ethanol did not lead to any changes in IFNgR expression as determined by flow cytometry (Figure 4). Therefore, it is unlikely that up-regulated IFNgR contributed to the phenomena reported here. It should be emphasized that we determined the expression of both IFNgR1 and IFNgR2 receptor subunits since it has been shown that, in certain experimental systems, an IFNg resistance was due to a lack of cellular expression of IFNgR2 chain alone . We also found that the effect of PMA in LS1034 cells can be significantly augmented by co-incubation with 172 mM ethanol. In certain types of tissues, ethanol has been shown to induce membrane translocation of PKC isoforms through activation of phospholipase A and release of diacylglycerol . This mechanism, however, does not appear to be significant in our case as ethanol without PMA failed to potentiate IFNg-induced MHCII expression in LS1034 cells. Alternatively, ethanol can modulate the activity of mitogen- and stress-activated kinase cascades. It has been shown that hepatocytes exposed to 100 mM ethanol for 16 hr have a higher activity of p38MAPK induced by EGF treatment . If in our experiments PMA did act through Ser727 phosphorylation of STAT1, the potentiating effect of ethanol can possibly be explained by its ability to stimulate the MAPK kinase cascade. It remains to be determined whether the restoration of IFNg-induced MHCII expression by PMA is unique to LS1034 cells. A potentiating effect of PMA has been reported in thyroid carcinoma cells  but, in contrast to LS1034 cells, normal IFNg response in those cells was only partially lost as a result of malignant transformation. Whether or not this phenomenon may be reproduced with other IFNg-resistant colon carcinoma cell lines is of particular interest, since colonic epithelium is physiologically exposed to PKC activators that enhance cytokine signalling in enterocytes during inflammatory responses within the intestinal mucosa . It is well established that, besides the MHCII molecules, IFNg can induce susceptible tumors to upregulate the expression of MHC class I antigens , tumor associated antigens , costimulatory molecules , and heat shock proteins . In addition, IFNg may have antimetabolic and antiproliferative influence on certain types of tumor cells . It has also been suggested that IFNg may cause responding tumor cells to secrete angiogenesis inhibitors . As it is not known which of those IFNg effects are missing or restored by PMA in LS1034 cells, a thorough evaluation of the possible clinical implications of our in vitro findings is quite difficult. However, if clinically tested PKC agonists such as Bryostatin 1 are able to rescue the IFNg-induced MHCII expression within the tumor bed, it might be appropriate to consider them for trials to improve the clinical efficacy of cancer immunotherapy. Human tumor cell lines – LS1034 colorectal carcinoma (ATCC Number: CRL-2158), SW480 colorectal adenocarcinoma (ATCC Number: CCL-228), MSTO-211H biphasic mesothelioma (ATCC Number: CRL-2081) and HepG2 hepatocellular carcinoma (ATCC Number: HB-8065) – were purchased from American Type Culture Collection. Cultures were routinely tested for Mycoplasma contamination by Specialty Laboratories (Santa Monica, CA) and were consistently negative. Recombinant human Interferon γ1b, specific activity 3·107 IU/mg, was purchased from InterMune Pharmaceuticals. Staurosporine and GF 109203X were from Calbiochem. Other chemicals used were phorbol 12-myristate 13-acetate, dimethyl sulfoxide, ethanol, propidium iodide and saponin (all from Sigma). Fetal calf serum and RPMI-1640 culture medium supplemented with 25 mM HEPES were from Irvine Scientific. Tobramycin, L-glutamine and 0.25% porcine trypsin – 0.53 mM EDTA were from Abbott Laboratories, BioWittaker and Gibco correspondingly. Monoclonal antibodies used in the study were: 1) mAb against human HLA-DR,DP,DQ, FITC conjugate (anti-MHCII-FITC), clone Tü39, mouse IgG2a; 2) mAb against human IFNg receptor R1 chain, biotin conjugate, clone MMHGR-1, mouse IgG1; 3) mAb against human IFNg receptor R2 chain, biotin conjugate, clone MMHGR-2, mouse IgG1; 4) mouse IgG2a isotype control mAb, FITC conjugate (IgG2a-FITC); 5) mouse IgG1 isotype control mAb, biotin conjugate; 6) mAb against Rb protein, FITC conjugate (Rb-FITC), clone G3-245, mouse IgG1; 7) mouse IgG1 isotype control mAb, FITC conjugate (IgG1-FITC). Streptavidin, phycoerythrin conjugate (SA-PE) and Streptavidin, Alexa Fluor®488 conjugate (SA-Alf488) were from eBioscience and Molecular Probes. Cells were propagated in T75 flasks in RPMI-1640 medium supplemented with 25 mM HEPES, 10% fetal calf serum, 200 mM L-glutamine and 40 μg/ml Tobramycin. When cells were in exponential growth phase, they were removed from plastic by trypsinization and seeded into the wells of 6-well trays (9 cm2/well) at a concentration of 3·105 to 5·105 cells / 4 ml / well. When cell cultures reached 40–60% confluency (usually, on the next day), growth medium was replaced with 2 ml of fresh medium containing variable concentrations of IFNg. Ten minutes later, another 2 ml of medium containing variable concentrations of PMA were added into the wells and the incubation continued for the next 48 hr. Experiments involving protein kinase inhibitors were performed in a similar way, except that Staurosporine and GF 109203X were added first, and IFNg (or PMA plus IFNg) were added 1 hr later. Staurosporine and GF 109203X were not washed away, so the cells were incubated with IFNg+PMA in the constant presence of inhibitors. 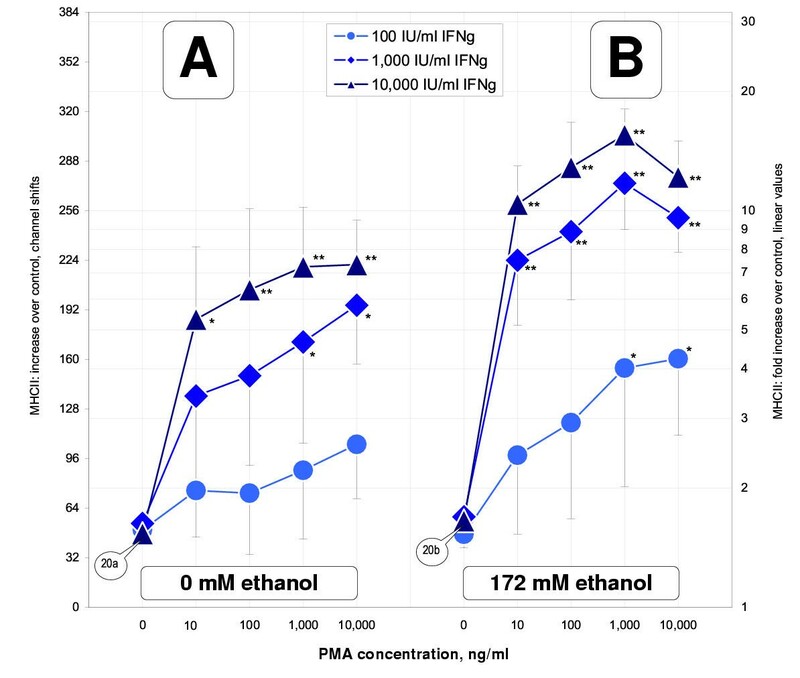 In a first group of experiments, stock solution of PMA was prepared at 1 mg/ml in ethanol, and the final concentration of ethanol in culture medium was adjusted to 10 μl/ml (172 mM). In all subsequent experiments, stock solution of PMA was prepared at 10 mg/ml in DMSO and the final concentration of DMSO in culture medium was adjusted to 1 μl/ml. Cellular monolayers were rinsed 3 times with Ca/Mg-free PBS and incubated for 20 min at 37°C in Hanks' balanced salt solution containing 0.25% trypsin, 1 mM EDTA and 25 mM HEPES. Detached cells were washed twice with staining buffer (PBS containing 10% FCS, 0.1% sodium azide and 25 mM HEPES, pH 7.4) and stained as described previously . Briefly, cells were transferred into the wells of round-bottom 96-well plates, the plates were centrifuged at 200 g for 30 seconds, the supernatant removed by shaking, and the cell pellets resuspended in 50 μl of staining buffer containing saturating concentration of anti-MHCII-FITC. After 30-min incubation at 4°C, cells were washed twice, resuspended in staining buffer and kept on ice before analysis on a flow cytometer (FACSCalibur™, Becton Dickinson Immunocytometry Systems). Immediately before analysis, 1 μg/ml propidium iodide was added to exclude dead cells. Matching isotype control mAb (IgG2a-FITC) was used at the same (0.25 μg/well) or a higher (1.0 μg/well) concentration as the specific antibody. The lack of staining of controls demonstrated that non-specific binding of IgG2a-FITC to PI-negative cells was negligible in all experimental groups (Fig 8B,8E,8H). Staining for cell surface IFNg receptors was performed similarly, except that cells were first incubated with biotin-conjugated mAb's (specific or isotype-matched) for 30 min, washed 2 times and then stained with SA-Alf488. Staining of fresh and trypsin-treated monocytes demonstrated that epitopes recognized by the mAb's against MHCII, IFNgR1 and IFNgR2 were resistant to 30 min digestion with 0.25% trypsin. Experimental conditions for measuring MHCII-specific cellular fluorescence by flow cytometry. Tumor cells were removed from plastic with 0.25% trypsin and 0.53 mM EDTA, washed, stained with FITC-conjugated monoclonal antibodies (mAb) and analysed on a FACSCalibur™ flow cytometer. Regions R1, R2 and R3 were drawn to exclude debris (G), dead cells (A, B, C) and cellular aggregates (D, E, F). Panels A and D show cells stained with propidium iodide alone. Panels B and E show cells stained with propidium iodide and the isotype-matched control mAb (IgG2a-FITC, 1.0 μg/50 μl). Panel C and F show cells stained with propidium iodide and the mAb against human HLA-DR,DP,DQ (anti-MHCII-FITC, clone Tü39, 0.25 μg/50 μl). Panel H shows frequency distributions of cells that passed R1 & R2 & R3 logical gate. M1, M2 and M3 are the median values of autofluorescence peak (M1 = 222), isotype control peak (M2 = 234) and HLA-DR peak (M3 = 445). Cytoplasmic IFNgR1 and IFNgR2 receptor subunits were detected by using a procedure described for intracellular cytokine staining . Briefly, cells were fixed in ice-cold 4% formaldehyde for 5 min, washed 2 times, permeabilized in staining buffer containing 0.2% saponin for 60 min at 4°C, incubated with biotin-conjugated mAb's (specific or isotype-matched) for 30 min, washed 2 times, incubated with SA-PE and washed again (saponin was present in staining buffer at all times). After the final wash, cells were resuspended in buffer without saponin and kept on ice until analysis. Monocytes expressing high levels of IFNgR1 and IFNgR2 receptor subunits served as a positive control. Expression levels of Rb protein was measured using a procedure described elsewhere . Fluorescent emission of FITC and Alexa Fluor®488 was collected on the FL1 detector (530 ± 30 nm, log mode) and fluorescence of PI-stained DNA was collected on the FL3 detector (>650 nm, log mode). Incubation of tumor cells with PMA or staurosporine dramatically increased cell-to-cell adherence and number of cell clumps. To deal with this problem, the FL2 detector (585 ± 42 nm, linear mode) was used to measure area and width of electronic pulses. PMT voltage of the FL2 detector was set high enough to minimize the number of FL2-width events appearing in channel 1. Regions R1, R2 and R3 were drawn to exclude debris (Fig 8G), dead cells (Fig 8A,8B,8C) and cellular aggregates (Fig 8D,8E,8F). Acquisition was stopped when at least 10,000 events had passed R1 & R2 & R3 logical gate (Figure 8H). List mode data files were transferred to a Windows-based computer for off-line analysis. Data were gated and the median values of fluorescence peaks were computed by using FCSExpress software written by David Novo http://www.denovosoftware.com. Total fluorescence of cells stained with MHCII-FITC antibody can be divided into 3 sources: (1) fluorescence caused by specific binding of MHCII-FITC, (2) fluorescence of MHCII-FITC bound to cells non-specifically and (3) autofluorescence of intracellular molecules such as NAD(P)H. An experiment performed to assess contribution of each of the three sources demonstrated that: (1) non-specific binding of IgG2a-FITC was negligible in all experimental groups (Fig 8H); (2) tumor cells incubated with PMA alone did not bind anti-MHCII mAb above the level of isotype control and (3) tumor cells incubated with PMA (or with PMA+IFNg) demonstrated 1.2–1.4 fold increase in autofluorescence. In order to correct for non-specific increase in autofluorescence, "brightness" of cells treated with PMA alone (Table 1, column 1) was subtracted from "brightness" of cells treated with PMA+IFNg (Table 1, columns 2–4), e.g., group 05a value was subtracted from values of group 11a, 17a and 23a, etc. All statistics were calculated using these corrected values that represent distances (channel shifts) between median of fluorescence peaks. The additional file "ANOVA.xls" contains both raw and corrected fluorescence values used to perform the analysis. While the manuscript was under review, results of a clinical trial had been published showing that a systemic combination treatment with IFNg and GM-CSF for as long as 9-weeks failed to induce MHCII on tumor cells in 9 out of 15 hepatocellular carcinoma patients. However, those 6 patients with inducible MHCII on hepatoma cells had better median survival as compared to MHCII negative cases (p < 0.0001) . The authors wish to thank Dr. Karen Berliner for critically reviewing the manuscript and Mrs. Angelica Cuevas for technical assistance.